Fellsmere Dairy Queen manager calls police after man trashes bathroom with feces and urine. FELLSMERE – On Saturday, the manager at the Fellsmere Dairy Queen called police about a man staggering around the store and leaving feces all over the public restroom. 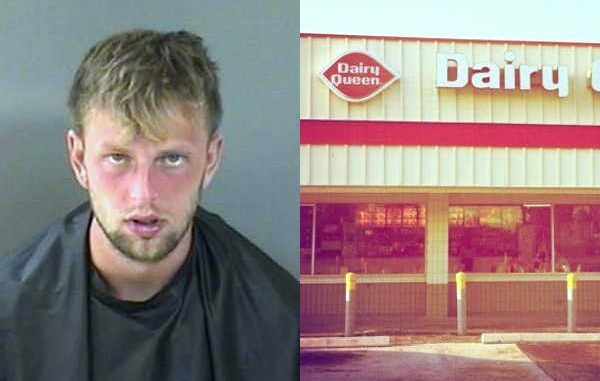 The Dairy Queen manager said the man, identified as 23-year-old Ethan Austin Murray, was in the public restroom for an extended period of time. She knocked on the door and waited for the subject to leave the bathroom. While waiting for Murray to exit, she could smell the overwhelming odor of urine and feces, according to the report. When Murray left the bathroom, she found urine and feces in the garbage can, floor, and sink. She then saw Murray staggering around the store “bumping into a glass display” and almost knocking over several glass cups, the report said. The Fellsmere Police Department made contact with Murray, who admitted that he urinated and put his feces in the bathroom sink and garbage can. “He stated that he could not explain why and that I would not understand,” the officer said in the report. The officer could smell the strong odor of urine and feces emitting from his person. There was also a strong smell of an alcoholic beverage emitting from his breath as he spoke. Murray was arrested for Disorderly Conduct of an Establishment and transported to the Indian River County Jail.